Hey! This weekend I’m appearing at the 5th Annual Greater Rochester Teen Book Festival in Rochester, NY with such YA luminaries as Laurie Halse Anderson, Holly Black, Barry Lyga, and yes, the shameless Terry Trueman, who I reveal here, still owes me $134.43. Here are two of the strangest, most spectacular pieces of art in the Order of Odd-Fish fan art gallery show in April. To the left, I join Georgia Greenberg with her fish that ate up Korsakov’s plane and later spewed it into Eldritch City. On the right, by Megin Wardle, a model of Colonel Korsakov’s digestion, complete with oracular messages! Georgia stretched iridescent, semi-transparent green glittery fabric over a copper frame to create the fish. 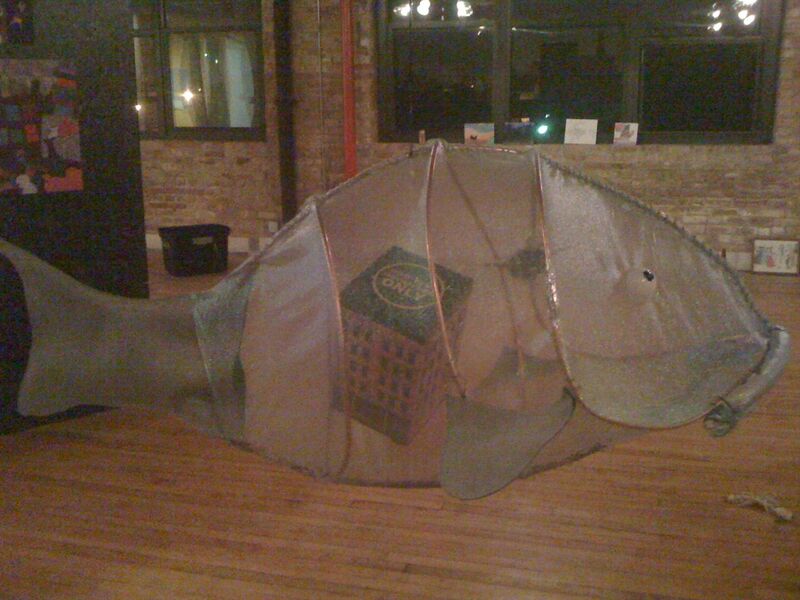 And inside its belly (hanging on fish line) we can spy Korsakov’s plane and the Odd-Fish lodge! We hung this in the middle of the gallery, and it was a fantastic centerpiece of the show. I met Georgia Greenberg through my protegee Freya. The whole Greenberg family is my personal version of The Incredibles. The father Mark was in one of my favorite bands from the 90s, the Coctails, and now runs Mayfair Recordings, making music for the likes of the Cartoon Network, occasionally helping record a legend like Mavis Staples, and putting out albums of great children’s music. Mark’s wife Anne-Marie is an artist (here’s her blog, and you can find her work on Etsy) and Georgia’s brothers August and Frankie are a ball. Here’s a video of when they made sushi out of candy. Can the Greenbergs please adopt me? Next: Megin Wardle’s piece, entitled An Illuminated Scale Model of Colonel Korsakov’s Wondrous Digestion. This one caused many a gasp of wonderment at the show. 1. Hark! Peril yonder! Plum pudding required to ascertain coordinates. 2. Intestines decalibrated. Message unclear. Need more ham. 3. Bountiful boons abound. Fancy meats recommended to bolster advantage. 4. Emergency! Surrounded by enemies! Excellent time for eggs. It is not often that an author is given the opportunity to eavesdrop on his own character’s digestion. What a fantastic, strange, and brilliant piece! I love the drooping, trailing intestines, the delicate papier-mache of the stomach itself, and the supernatural glow of the light. I am currently cherishing this as the World’s Awesomest Lamp at my house. I’ve been friends with Megin for nearly ten years. Totally coincidentally, in the past year or so, we both ended up working at the University of Chicago. I maintain the software that keeps track of grant proposals and awards, but Megin’s an actual scientist (a Ph.D!) who studies the social effects of alcohol on humans. For many years Megin has brought volunteers into her lab, given them alcohol, and then asked them questions. In the name of science! Thank you, Megin and Georgia! I’m lucky to know you, and I’m honored you made such amazing, mind-bending art for the show.